„get together” in Flensburg – Riva Club Deutschland e.V. 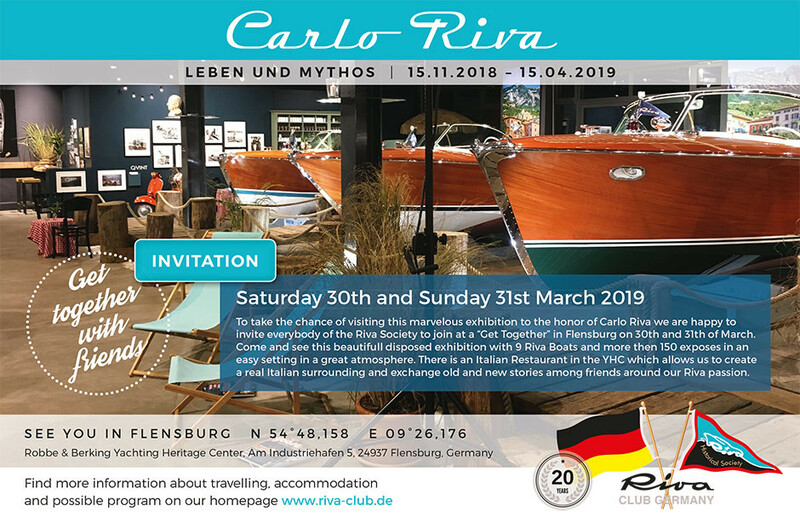 To take the chance of visiting this marvelous exhibition to the honor of Carlo Riva we are happy to invite everybody of the Riva Society to join at a “Get Together” in Flensburg on 30th and 31th of March. Come and see this beautifull disposed exhibition with 9 Riva Boats and more then 150 exposes in an easy setting in a great atmosphere. There is an Italian Restaurant in the YHC which allows us to create a real Italian surrounding and exchange old and new stories among friends around our Riva passion. welcome to our „get together” in Flensburg. © Copyright 2019 Riva Club Deutschland e.V.